This document provides instructions on how to configure Windows to boot directly into safe mode. If you want to temporarily boot into Safe Mode, see Windows - Booting into Safe Mode. This document contains instructions on how to boot into Safe Mode if those steps do not work. Go to the Start Menu, type msconfig in the search box, and press Enter. Note: If you are running Windows 8, go to the Start Screen and simply begin typing msconfig. Press Enter or click on the program in the search results to launch it. Check the Safe boot check box under Boot options. Select the Minimal radio button for Safe Mode or Network for Safe Mode with Networking. Then click Okay. Note: To exit safe mode, repeat all steps, but in step 4 be sure to uncheck Safe boot and restart the computer. Go to the Start Menu, and select Run. Type msconfig and then click OK. 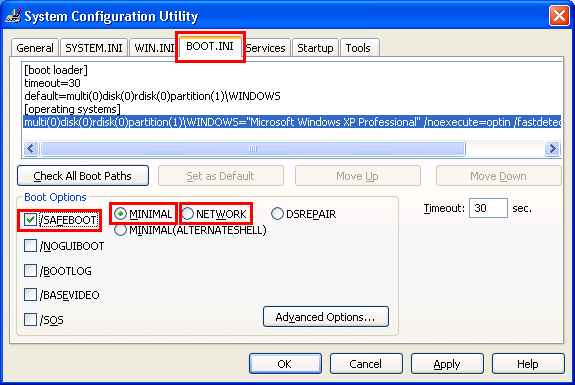 In the System Configuration Utility window check the /SAFEBOOT option. Select the MINIMAL radio button for Safe Mode or NETWORK for Safe Mode with Networking and then click OK. In the System Configuration dialogue box, click Restart. The computer will restart in Safe mode. Note: To exit safe mode, repeat all steps, but in step 4 be sure to uncheck /SAFEBOOT and restart the computer.